With Visual Voicemail, customers don’t have to call into their mailbox to retrieve or delete messages. Voicemails get pushed to their device. They can choose which messages to listen to- without hearing voicemail instructions and earlier messages! Restrictions: This add-on is only available on iPhone 4, 4s, and 5. 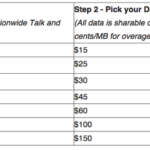 Since this service uses data, we recommend that customers have a data plan or add-on to avoid pay per use data charges. If a customer has a data block on their phone or account, this service will not work. This service does not work over Wi-Fi. Customers must have voice mail set up on their account for this service to run. iPhone software and carrier settings must be up-to-date for Visual Voicemail to work. If the customer’s voice mailbox is full, they won’t be able to receive any new messages to their voice mail; this means they won’t get a Visual Voice message either. As noted in the restrictions, Visual Voicemail is only available for the iPhone 4, iPhone 4S and iPhone 5 and must require a data plan for the service to work. Numerous unlocked iPhone users have been using Koodo on month-to-month plans and have long awaited the arrival of Visual Voicemail. That day is finally here. Let us know if you’re going to jump on this.